Shortline and regional railroads are the backbone of today's railroad industry. As Class One railroads concentrate more and more on mainline operations, smaller railroads fill the need to move goods from branch to main lines. 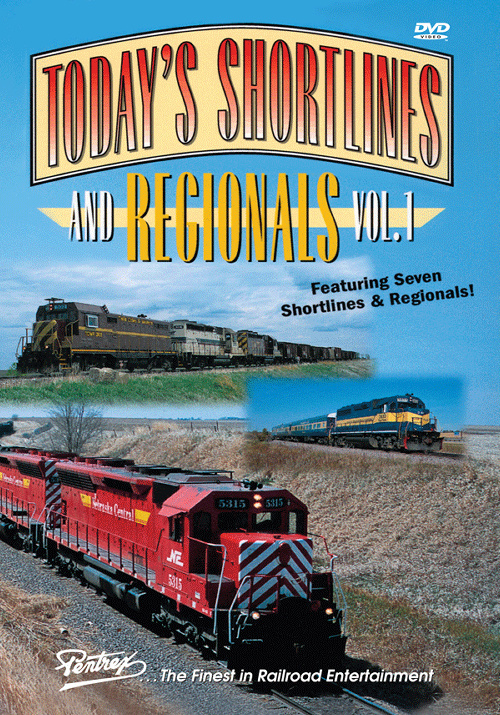 In this volume, Pentrex visits seven shortline and regional railroads in the upper Midwest. Starting in Nebraska, we view ex-Rio Grande SD45s in service on the Nebraska Central, which runs over former UP rails. Heading north, we find the Nebraska Northeastern running on old BN iron. In Iowa, we see the Iowa Northern's GP20 in its beautiful maroon paint scheme. This shortline traverses former Rock Island rails and connects with the Union Pacific. Moving up to Minnesota, we catch freight and a business train on the Dakota, Minnesota and Eastern. This regional railroad operates on ex-Chicago and North Western rails. While in Minnesota, we visit the now-extinct Dakota Rail and then the Minnesota Commercial with its newly-acquired Alco RS-18. The show closes with the Twin Cities and Western on the old Milwaukee Road main line. With their wide array of motive power and scenic environments, these smaller railroads offer great railroading entertainment, as you'll see in Today's Shortlines and Regionals! trackside (Missouri) on 2014-07-01 18:31:49. Good off the beaten path coverage of lesser covered rail lines through farm fields, dirt roads and into the city. Infrequent feeder line service with a mix of older motive power and consists rocking down uneven back rails is as down home as it gets. The dumping of ballast is a nice additive not often seen. Picture quality is grainy and seriously distracts from the content as it was originally distributed in VHS.